"Happiness must be earned." So it is written in the stars, quite literally, in The Thief of Bagdad. It is not often that a film can be both enjoyable and provide moral lessons for children and adults without being preachy. The Thief of Bagdad might be a little long, but it also has beautiful imagery and special effects that in 1924 must have been spectacular, and that in almost 90 years still hold up remarkably well. Ahmed (Douglas Fairbanks), the titular thief, is a cocky, clever man. He lives by his wits and athletic skills and openly mocks the teachings of the Holy Man (Charles Belcher), a gentle and kind imam at the mosque. God, faith, all that is lies, Ahmed declares. "What I want, I take!" The Thief of Bagdad proclaims. This is exactly the same philosophy held by The Prince of the Mongols (Sojin). He sees the Palace of the Caliph and covets it. As it so happens, the Caliph's daughter (Julanne Johnston) is now being prepared to wed, and princes from near and far are converging on Bagdad to win her hand. Ahmed had entered the palace to steal, but at the sight of the sleeping princess he forgets this and falls in love. As the Princes of Persia, the Indies, and Mongols come to Bagdad, they are joined by the Prince of the Seas, the Isles, and the Seven Palaces. It is Ahmed himself, disguised. He now fulfills a prophesy the Princess believes: that whosoever touches a rose bush would win her hand. The Princess' maidservant (Anna May Wong) warns her master, the Mongol Prince, of the prophesy but is beaten to the bush by Ahmed, who was thrown into it by a startled horse. The Princess has chosen Ahmed, but he confesses who he is. The Maidservant has already told her lord (since she recognized him from his previous break-in) and Ahmed is driven out of the palace, escaping only through the intersession of the Princess, who bribes the guards to show him a secret passage out of the palace. To mend her heart (or delay marriage) she says that whoever brings her the rarest gift within seven moons will win her hand. The Prince of the Indies finds a crystal ball within a god that can see anything in the world. The Prince of Persia finds a flying carpet. The duplicitous Mongol prince has ordered his servants to spy on the others, and once he acquires an apple that can revive anyone he orders the Princess poisoned. In this way, he will sweep in, save the Princess' life, and she will marry him (and he can capture Bagdad at the same time). Meanwhile, a repentant Ahmed turns to the Holy Man, who advises him to go through a quest to acquire a rare gift. It means going through such things as The Valley of Fire, The Valley of Monsters, the Cavern of the Enchanted Trees, meet The Old Man of the Midnight Sea, The Abode of the Winged Horse, and the Citadel of the Moon. The Mongol Prince convinces the others to use the crystal ball, where they see the Princess near death. Using the flying carpet they sweep in and while the apple saves her life, the Princess points out that all three gifts were needed to save her. That, and a glace at the crystal ball to see Ahmed riding towards the capital, convinces her only he can marry her. The Mongol Prince, tired of waiting, decides to take Bagdad by force. Ahmed, however, with some magic whips up an army to defeat them. With that, The Thief of Bagdad becomes The Prince of Bagdad, with the Princess won. If anything, The Thief of Bagdad has a beautiful, almost child-like wonderment that enchants from the get-go. There are two reasons for this. The first is William Cameron Menzies' production design (the underwater sequence where Ahmed goes beneath the sea to find more to lead him to the final prize is amazingly beautiful). The Thief of Bagdad is filled with such lavish visuals, from the Mongols' Palace to the vast Bagdad night sky that it truly is a visual treat to enjoy. The second element that makes this a breathtaking film is Douglas Fairbanks' performance. His is a lusty, joyful, exuberant performance. Perhaps today it might be seen as being wildly over-the-top but I found it full of brim and vigor, Fairbanks' filling the screen with a joie de vivre that makes watching him a joy. The fun he is having is infectious, and one admires his amazing athleticism. In regards to the rest of the cast, Anna May Wong is alluring as the villainous maidservant. I can't say this made her a star, but one can see how she emerged to become the first Asian superstar. In regards to the special effects, we see that some of them are not as extraordinary as they might have been (the flying horse sequence being weak by today's standards). However, when we see the newly-married Ahmed and Princess flying over the citizens of Bagdad, it still has a great beauty and stands up remarkably well. One thing that might not have been commented on is that The Thief of Bagdad is quite respectful of Islam. The imam is a wise man, even when the other congregants in the mosque want to attack Ahmed for his blasphemy it is the gentle Holy Man who defends the thief. I thought the film was showing if not reverence for Islam at least a respectful tone in how it is shown. 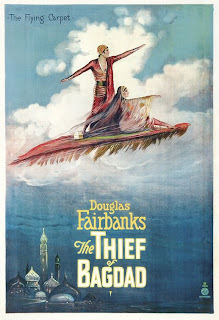 If I would have anything against The Thief of Bagdad, it is that it was a bit long. One wishes we didn't have so many moons to endure or so many journeys of Ahmed to go through. Minus that, The Thief of Bagdad is a beautiful film with a true message to it: happiness must be earned. One can see why Douglas Fairbanks was one of the first true stars of cinema, and the film itself is a delight (if a bit long). You'll be swept away by The Thief of Bagdad.